(Trent Nelson | The Salt Lake Tribune) Dolce Sicilia, the newest sibling in the Sicilia Mia and Antica Sicilia family of Italian restaurants. 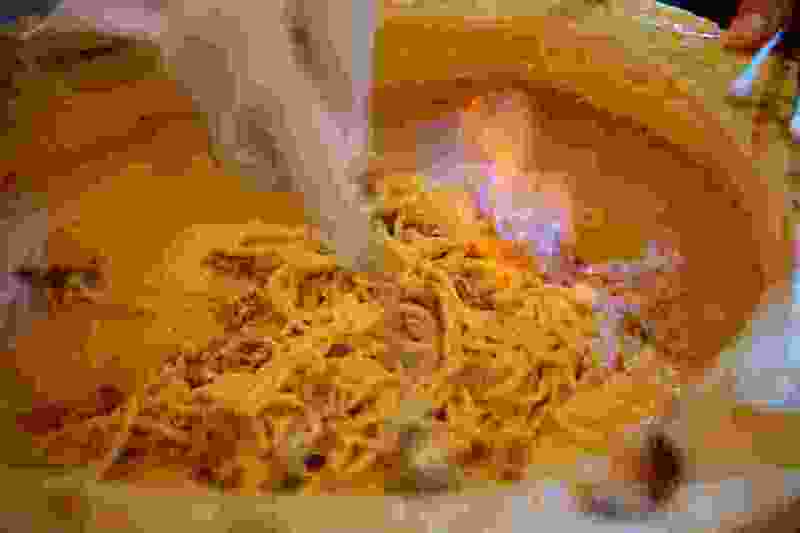 Spaghetti alla Carbonara, Friday June 22, 2018. $23.95 • This luscious, artery-clogging dish is partly prepared table side. Watch as the waiter dots your plate with flourishes of reduced balsamic vinegar, squeezes alcohol into a wheel of Grana Padano and ignites the cheese. Staff brings the cooked house-made spaghetti, glossy with eggs and mixed with pancetta, which is then tossed into the melting vessel. The waiter scrapes the cheese from the edge of the wheel, just like you’ll be scraping your dish to get every last bite. Dolce Sicilia • 1048 E. 2100 South, Salt Lake City; 385-528-3275. Open daily, noon to 10 p.m. Dinner begins at 2:30 p.m.